Hanging Christmas lights from the roof is a long-standing tradition. When people do this, they often hang the lights from the gutters. While this is not a bad thing, it can be a problem if not done properly. If you plan on hanging Christmas lights on gutters, try these tips to do it better this year to save your gutters. Most stringed holiday lights come with plastic clips. This is to encourage consumers to avoid using things like staple guns and nails to hang them. Nail and staples damage the roof, and they certainly damage the gutters if you try to use them there. If you find that the clips that come with your lights don’t work well with your gutters, there are many, many other options available to be purchased separately. 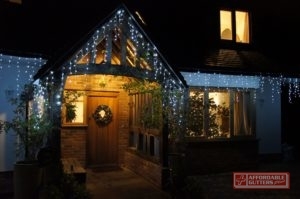 There are all sorts of clips that not only suit your gutters, they suit your lights. To make the experience better, measure your gutters and take note of your bulb sizes, and number of bulbs, as well as string length. All of these things will let you know how many clips you need. Then, you can buy clips that set your lights in various patterns. If all you want is a basic scalloped pattern, then find a clip that will do that for you. If you want to hold each larger bulb in place separately, there are clips in which you can slip your bulb so that it sits still exactly where you want it. Remember, keep your gutters clean throughout the season. Dirty, cluttered gutters make for excess moisture and ice, and they weigh down your roof edge. Adding lights to all that makes for weight and fire hazards, too. Have a great, safe time hanging Christmas lights on gutters this year. And, when you need gutter repair and installation in Canton, GA, remember to call us at 770-735-4433. Posted in Uncategorized on December 13, 2017 at 7:11 pm by Affordable Gutters Plus LLC.